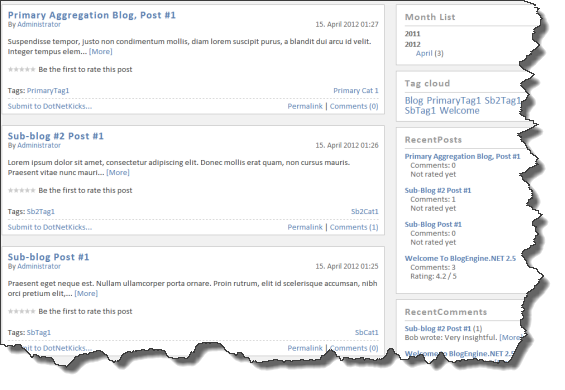 The much requested and highly anticipated "multiple blogs" feature has made it into BlogEngine.NET 2.5. BE.NET 2.5 will be released at the end of June. This post goes over how it works and some information on making themes, widgets, extensions and your code be multiple-blog compatible. Let's look at the properties for each blog instance. Any name you'd like to give the blog instance. The name does not appear anywhere outside this Blogs management page. This is the name of the folder where the blog data will live. Basically a copy of the files and folders for each blog instance will be made -- i.e. each blog instance will have its own separate folder of data. This makes the blog instances portable and keeps the data separated. Databases can also be used with multiple blogs. Even when using a database, there is still some data (blog post images/files, and a few other small files) that is stored in the file system. 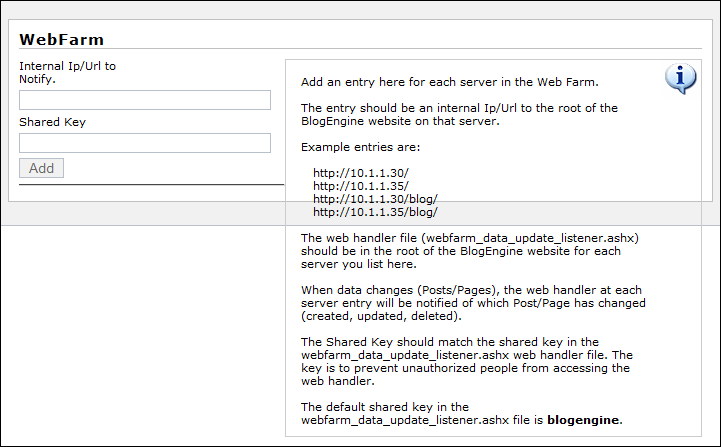 So a separate folder will be created for each blog instance even when using the DbBlogProvider. As in the past, the primary blog instance data is stored in App_Data. There's now a new Blogs folder under App_Data. 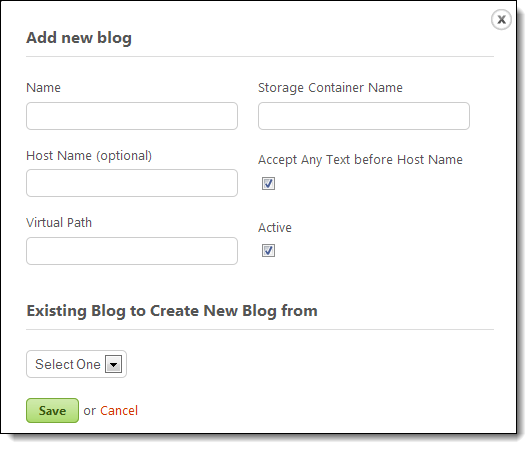 Within App_Data\Blogs, a new folder matching the "Storage Container Name" will be created when a new blog instance is created. The data that is initially put into this child blog storage folder is explained next. This is partially related to the above Storage Container Name. When a new blog instance is created, the "Existing Blog to Create New Blog From" dropdown list will contain all of the existing blog instances. The files & folders from the existing blog instance you choose here will be copied into the storage folder for the new blog instance as "initial data". BE.NET 2.5 also includes a "Template" blog instance (which is inactive), and can be used as the existing blog instance to create new blog instances from. The Template blog instance has the same data and settings as the primary blog. You can optionally change the Template blog data, or even create multiple template blog instances to choose from when creating new blog instances. If using a database, in addition to the storage container folder being copied for the new blog instance, the DB data from the existing blog instance will be copied in the DB for the new blog instance. So for both XML and DB, the new blog instance created will start off using the exact data, files, etc that the blog instance you copied from has. Note, there is no Template blog included with the database. You can still create your own template blog for the DB by creating a new blog instance of your Primary blog, naming it "Template" (or any name) and customizing it to your liking. The 2nd and 5th examples above would be given a Virtual Path of ~/blog1 and ~/blog2 respectively. Prefixing the virtual path with ~/ is required, and the ~/ will automatically be inserted for you in the Virtual Path field. In the 3rd example above, the Host Name would be "blog1.example.com", in the 4th example the host name would be "blog2.domain.com" and in the 5th example, the host name would be "blog.domain.com". If you are only using a single hostname for your blog, you can omit the hostname. Entering it is really only required if you will be using multiple hostnames. With the Virtual Paths above of blog1 and blog2 (examples 2 and 5), you do not need to create physical directories named blog1 and blog2. These are virtual directories that BE.NET will look for in the URL to treat that request to the web server as being on behalf of those blog instances. At the same time, you will want to make sure that physical directories matching the virtual paths (blog1, blog2, etc) do not already exist. The "Accept Any Text before Host Name" checkbox is another option to allow any text (subdomains) to appear before the Host Name you enter. If you leave this box unchecked, then the Host Name you enter will need to match exactly what is in the browser address bar. If you will be running a single instance blog, all of the themes, extensions and widgets that run under BE.NET 2.0 will still work perfectly fine for BE.NET 2.5. If you will be running multiple blog instances, existing themes, extensions and widgets may need some adjustments to work with this new multiple blogs feature. The following types of issues need to be addressed. Similarly, Utils.AbsoluteWebRoot also takes the relative path of the current blog instance into consideration. If you need the "real" web root of the application, you could use ~/ or you can use a new Utils.ApplicationRelativeWebRoot property. With extensions, the primary blog instance has the "master" switch over whether extensions are enabled. 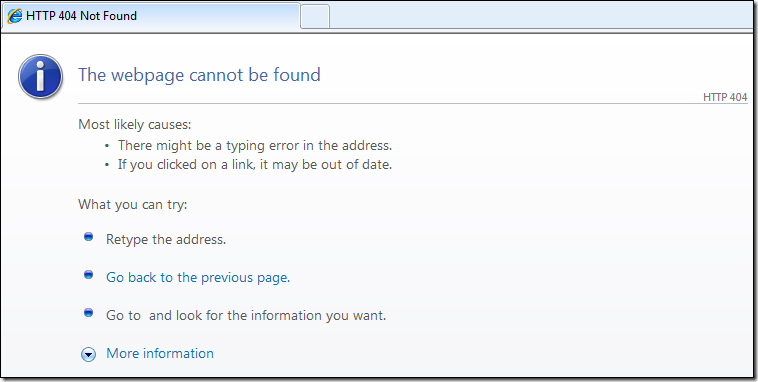 If the primary blog instance disables an extension, that extension is no longer available to any of the child blogs. 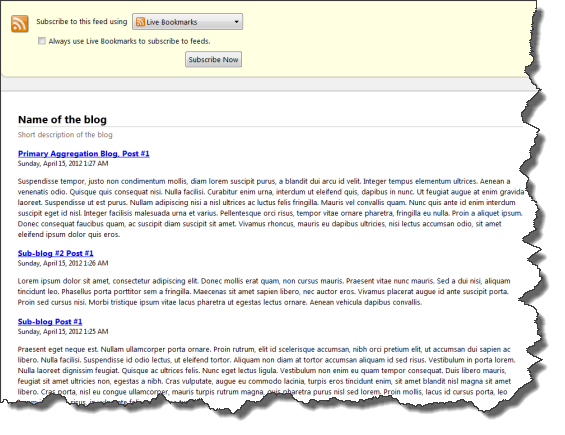 If the primary blog instance enables an extension, by default this extension will be enabled for all the child blogs. A child blog can disable an extension. The new lines of code above are lines 3 and 4. It makes a call into the Extension Manager, passing to it the name of the extension (in this case, ResolveLinks). ExtensionEnabled() will return false if the extension is disabled for the current blog instance. As mentioned earlier, if you will be running a single instance of BE.NET, these changes described above will not need to be made -- although they can be made. Overall, I think we maintained a lot of backwards compatibility as the changes you will need to make to have a multiple-blog capable BE.NET application are very minimal. The themes, widgets and extensions included with BE.NET 2.5 already have these changes made to them. Enjoy the new multiple blog capability and if you run into any issues or have any suggestions, the best place to pass along your thoughts is in the CodePlex discussion group.